Gearing up for their much-anticipated stint in the European Championships, Lithuania released their preliminary squad for their upcoming hosting of the EuroBasket 2011. 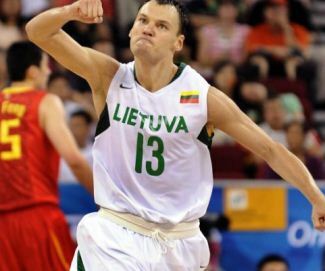 Former NBA player Sarunas Jasikevicius and Rimantas Kaukenas, who have not donned the national colors for the past three years, will be back for the Lithuanian national squad along with Ksistof and Darjus Lavrinovic. Jasikevicius and Kaukenas last played for the Lithuanian national team at the 20118 Beijing Olympics, while Lavrinovic twins were also not a member of the team that bagged the bronze medal in the 2010 World Basketball Championship in Turkey. Notably missing in the 20-man preliminary roster are Toronto Raptors forward Linas Kleiza and Jonas Maciulis, who are both suffering from serious injuries. Reports came out, saying that Ramunas Siskauskas was asked to came out from retirement to fill in the gap left by Kleiza and Maciulis, but the veteran forward, who retired after their bronze-medal finish in the Beijing Olympics, begged off. Lithuania, who will start their preparation on July 18 in Druskininkai, was drawn in Group A, where they will collide with defending champions Spain, Poland, Turkey, Great Britain, and a soon-to-be-determined qualifier.